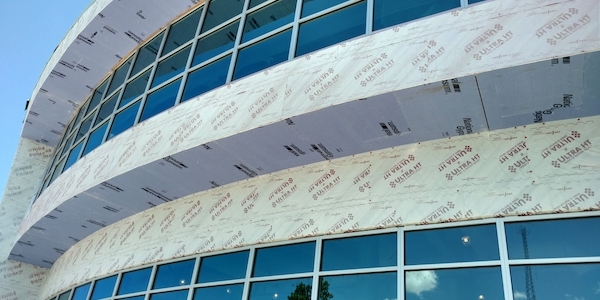 MFM Building Products’ Ultra HT Wind & Water Seal high temperature roofing underlayment is developed to be ideal for vertical side wall applications. The self-adhering “self-stick” membrane is composed of a cool white, cross-laminated, high density polyethylene film laminated to a high temperature rubberized asphalt adhesive system rated to 250°F. The product is said to be self-sealing around fasteners and offers a 90-day UV exposure rating. Ultra HT has a thickness of 45 mils and is available in a 12”, 18”, and 36” by 67’ length rolls. As a roofing membrane, Ultra HT meets ASTM D 1970, Florida Building Code FL16562, and Miami-Dade County NOA 13-1125.06. The product comes with a 10-Year Limited Warranty.